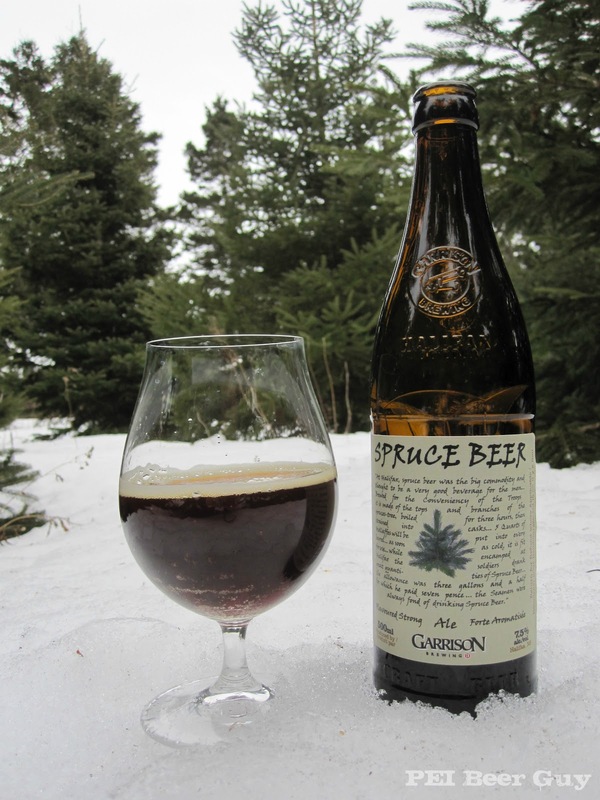 This is the second release of Garrison's popular seasonal, their Spruce Beer. Last year's was like French-kissing a Christmas tree (not all bad). This year's recipe changed a bit... let's see how it panned out. It pours with about 1/2 a finger of head - which doesn't last too long. The colour is pretty much the same as last year, but not quite as dark, I don't think... maybe more red. I can see through the bottom of the glass, too, which I couldn't do last year. After the initial head falls, there are just dots of lacing - like snow - after each sip. The aroma has less spruce / wood than last year - it's still very much at the forefront, but it's more balanced now. It has a maltier tone to it this year, and smells like a much lighter ale than last year's. The flavour is much lighter than last year, too - much more approachable as something you could drink the whole bottle of "normally". It's not like kissing a Christmas tree. Well... maybe it is a little, but not full-on French kissing. No need to pursue that analogy further. Let's just stop there. You still get spruce sap / gum, needles, molasses, and even something more lightly sweet - like orange, almost. This is much different from last year's beast, even with only two+ months on it (when I drank it). The bitterness actually appears a bit this year, and even some light hops in the burps. Overall, it comes off a bit like a strong red or brown ale with added flavours. The carbonation is a tingle in the background - not much at all. There is still a bit of a sticky finish, but nowhere near as chewy or thick a feel as before - it has a medium body now... even a bit of bitterness comes out in aftertaste. Overall, much easier to drink than last year - easy to enjoy... still, I kind of miss last year's brute spruce strength!